Graphic design students begin their training eager to learn all aspects of their trade. After sometime students find their niche and will often focus their studies towards 1 or 2 key areas of the curriculum. In my case, typography and logo design were my desired graphic design niches. I enjoy bringing character to a logo through the use of typography. Type alone can create a unique look for a brand, elevating a business to better stand out against a sea full of competitors, and to do this well takes some skill… This is my niche and I’m constantly striving to improve my skills and understanding of typography & logo design. My font archive these days is quite mammoth, however I must admit that my understanding of correct font usage is rather vague. I came into this realisation recently, while purchasing a font for a branding project for large commercial entity. I asked myself the question “If I buy the font and use it for my client’s project, can I then use it for other design projects down the track?” To which I wasn’t sure of the correct answer. I’m aware that it is my duty as a professional graphic designer to educate myself on the topic of font licensing and usage in commercial design, not only to further my professional development but to bring clarity to the muddy waters for everyone else who has found themselves in the same boat. As the humble Wernher von Braun once said “Research is what I’m doing when I don’t know what I’m doing.” Feeling much like Wernher von Braun, I started off with some quick and up to date research on the internet. In my quest for knowledge I wanted to see the world of font licensing from the perspective of a typographer (type designer), which is the artist who designs the typeface itself. I threw a line to an experienced type designer who had once mentored me in typography and I picked his brain on the topic. My mentor for the workshop was the typographer Wayne Thompson who established the Australian Type Foundry. Wayne is well recognised in the industry for his work and enthusiastic passion for quality typography. I fired Wayne an email jam packed full of curious questions about the legal obligations of designers and clients when using fonts in commercial design applications and to my surprise, Wayne kindly responded in great detail. Wayne managed to give clarity to what I previously perceived as cloudy areas and he also offered me most of the pieces of the puzzle that I didn’t yet have. Now that I’m schooled up on font usage I feel that I can confidently share the facts to keep you on the right side of the law. Because when you break laws there are penalties and in some cases you need to be particularly careful with font use in commercial applications. What are you going to do… Sue me? If we don’t understand a typeface license agreement, or just blatantly disregard a font licence by improper use in a commercial application, then what’s the worst that could happen? Here is a scenario I would like you to envision; an authoritative body for the protection and regulation of creative content on the internet has branded itself with a logo crafted from a specific typeface. The typeface used was never officially purchased by the design agency or the client (the Anti-Piracy Authority), meaning they didn’t have the licence agreement to use that font at all! In addition to this, the font used was never made commercially available for purchase. To be clear, it’s a custom typeface that has been pirated, and then used to design the logo of an Anti-Piracy Authority. The concept above is ludicrous! To think that an entity that protects against improper usage of creative content would make the careless mistake of NOT purchasing a commercial font licence when establishing their logo and branding. Well guess what? HADOPI, which stands for ‘High Authority for the Distribution and Protection of creativity on the Internet’, made this careless error! Oh the irony. This all came to the attention of HADOPI relatively soon after the branding was launched. Apparently what had happened was Plan Créatif, the design agency that developed the HADOPI logo unintentionally presented an early concept as the final graphic solution. 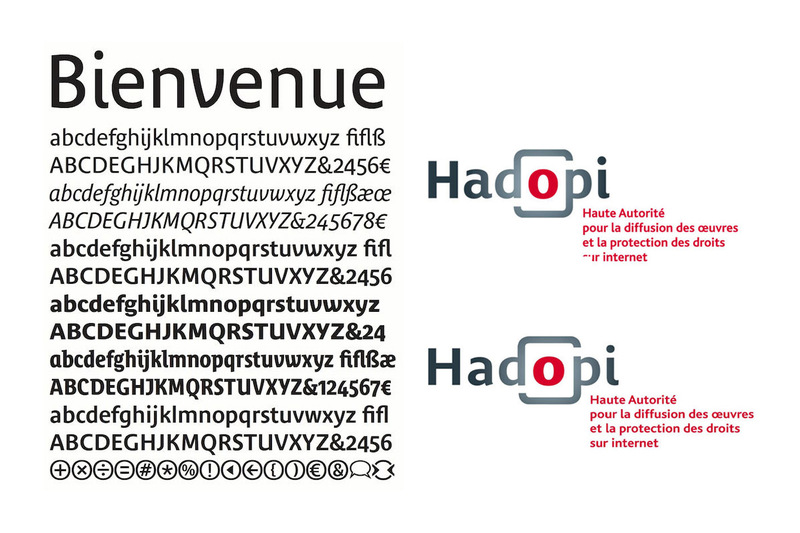 What makes this case a little more serious is the font used by HADOPI was the custom font ‘Bienvenue’ – created by Jean François Porchez for his client France Telecom-Orange. The Plan Créatif designer had somehow sourced the custom typeface from a rogue source even though the ‘Bienvenue’ font was never made available for public or commercial use. Ooops – it look’s like HADOPI made a rookie error! Luckily for HADOPI, France Telecom-Orange decided not to take further action, and HADOPI quickly amended their logo with the purchase of ‘FS Lola’ and ‘Bliss’ which become then new replacement fonts. As for Jean François Porchez, the creator of the ‘Bienvenue’ font, he made contact with his lawyer to see what course of legal action could be taken against the copyright body. I contacted Jean François Porchez to see what eventuated from 2010 legal proceedings and he kindly shared some documentation with me. Unfortunately the legal documentation is in French and even after translation it was quite difficult to make sense of what the final outcome was. An ongoing case holds a strong example of what can come from use of fonts without a licence. Universal Music Group is currently being sued for a whopping $1.2 million by HypeForType. Graphic Designer Stuart Hardie designed ‘The Vamps’ band logo on the Universal Music Group label, he used two fonts; ‘Namami Rounded’ and ‘Ebisu Bold’. Stuart had only purchased a ‘basic license’ back in 2013, however Universal Music never purchased the commercial license. Universal Music Group are currently being sued for $1,251,235 in damages and HypeForType have also requested Universal purchase to appropriate licenses or have all existing band merchandise and marketing materials destroyed. It’s unlikely the band will stop using the current branding, so the most likely outcome will be a settlement. There you have it – a fantastic example of the serious repercussions that can come from improper usage of fonts in commercial design work. You have been warned!